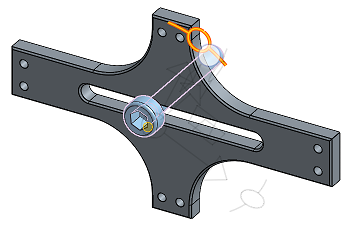 The first Mate connector selected (inferred or existing) serves as the rotational and translation movement point and the second Mate connector selected (inferred or existing) serves as the stationary point. Begin by creating Mate connectors on each entity, or use the implicit Mate connectors visible upon hover. Select two Mate connectors (inferred or existing), selecting the pin’s Mate connector first. To limit the movement, check Limits and supply (optional) minimum and maximum values to control the range of motion of the Mate.Limits are visualized in the graphics area as dashed lines with bars at the ends. The dashed lines represent the direction and distance of the movement and the solid lines represent the limit. To supply an offset distance, check Offset and supply a distance. 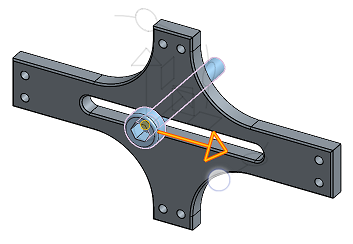 Pin slot Mates can offset the entities only along the Z axis. Offset distances are visualized in the graphics area as dashed lines between the mates, displaying the value and the axis. Enter the distance in the dialog. When you click on a Mate, graphics are displayed to indicate the direction of the X, Y, and Z as defined by the Mate along with the offset and the range of limits dimensions (if any). 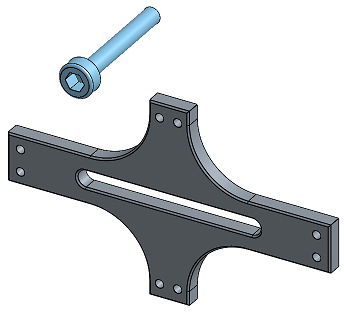 Applying an offset should be viewed as moving the entire coordinate system. The offset is relative to the Mate connector (inferred or existing) selected first. Click the entity to access the manipulator. Click and drag the various manipulator handles to see which motions are allowed; notice that only rotational movement about the Z axis and translational movement along the X axis is allowed (Rz, Tx). Tap the Pin Slot Mate tool. Confirm that Pin slot is selected in the Mate type field. 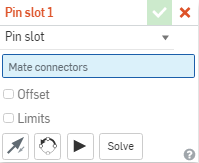 Select two Mate connectors (inferred or existing) to use. Optionally, tap Offset to provide an offset distance. Optionally, tap Limits to set distance limits for movement. Optionally, tap to Flip the primary axis, Z orientation of the instances. Optionally, tap to Reorient the secondary axis; rotate the quadrant orientation (in the XY plane) of the instances by 90 degrees at a tap. Touch and drag OR use the Triad Manipulator to move one of the parts. Notice that only rotational movement about the Z axis and translational movement along the X axis is allowed (Rz, Tx).